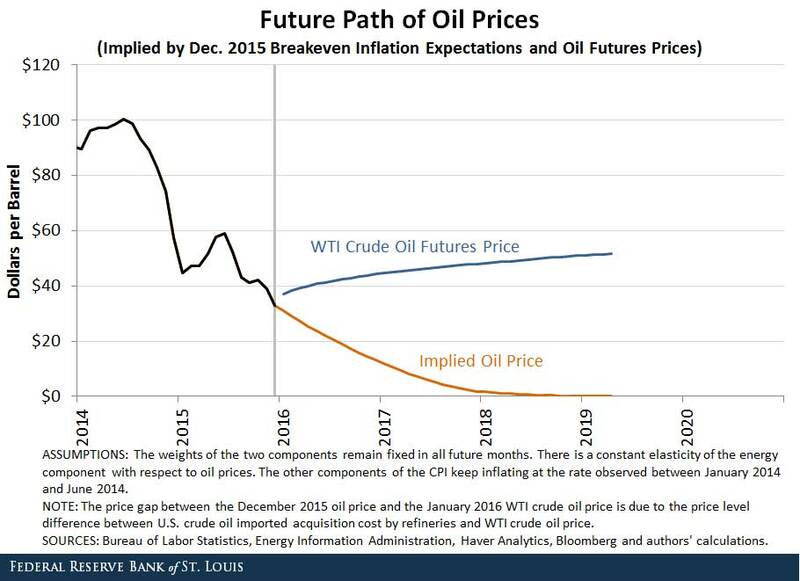 One or more rate hikes by the Federal Reserve in 2016 remains a real possibility. 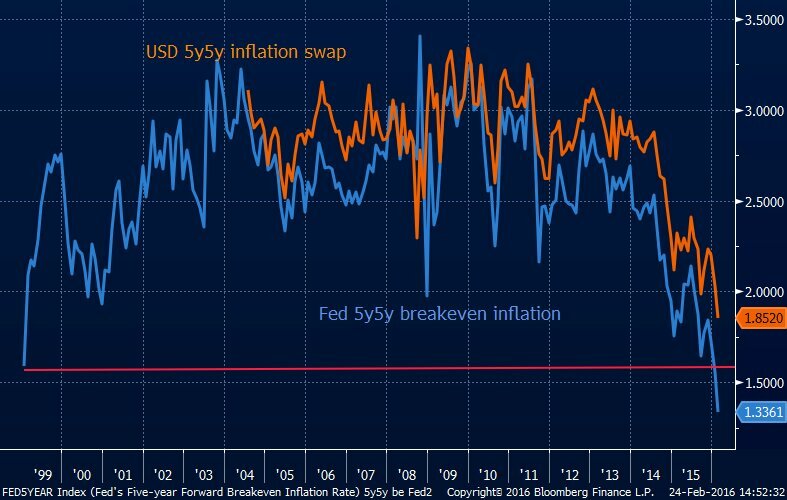 Why would the Fed consider such a policy action given the recent collapse in inflation expectations? Reuters: - The Federal Reserve must act to stop inflation expectations from getting too low, St. Louis Fed President James Bullard said on Wednesday, reiterating his concerns about continuing to raise interest rates. The U.S. central bank cannot let low inflation expectations "get out of hand," he told a dinner of bond traders here, adding he "can't stomach" currently low readings. "It's just that they've fallen so far that it's got to be a concern." However a number of researches have suggested that with a relatively stable core inflation in the United States, oil prices would need to collapse to levels that are neither consistent with today's forward curve nor sustainable. 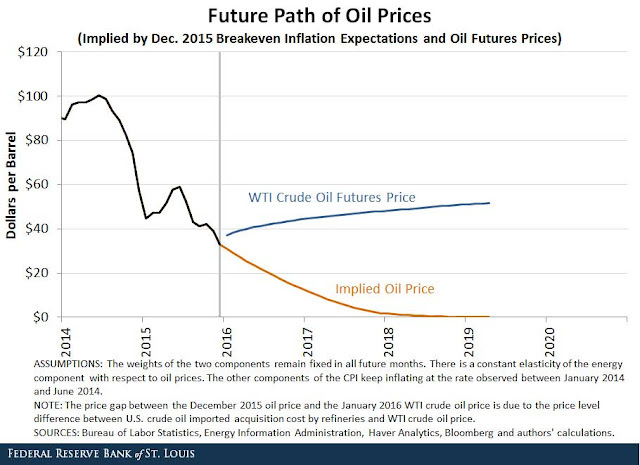 Therefore, these studies argue, the current market-based inflation expectations are simply irrational. 1. Here is the latest analysis from Goldman Sachs. 2. Also, a study from the St. Louis Fed shows a similar result. Moreover, US inflation measures are starting to stir - especially in the services sector. This is something the FOMC is not going to ignore. Below we have some of the recent reports. 1. The core PCE inflation, the Fed's primary inflation measure, exceeded consensus on Friday. 2. US CPI measures, both the headline and the core, also came in above expectations. 3. As an example of where some of this inflation is coming from, shown below is the medical care CPI. It has been subdued last year but is now is waking up again. Additionally, the cost of shelter in the US is now rising at over 3% per year, with the rate continuing to increase. Sadly, this is materially higher than the national wage growth rate, putting pressure on Americans with low-paying jobs. 4. We also see the so-called "sticky" CPI (the less volatile components of the CPI) reaching 2.5% - the highest since 2009. 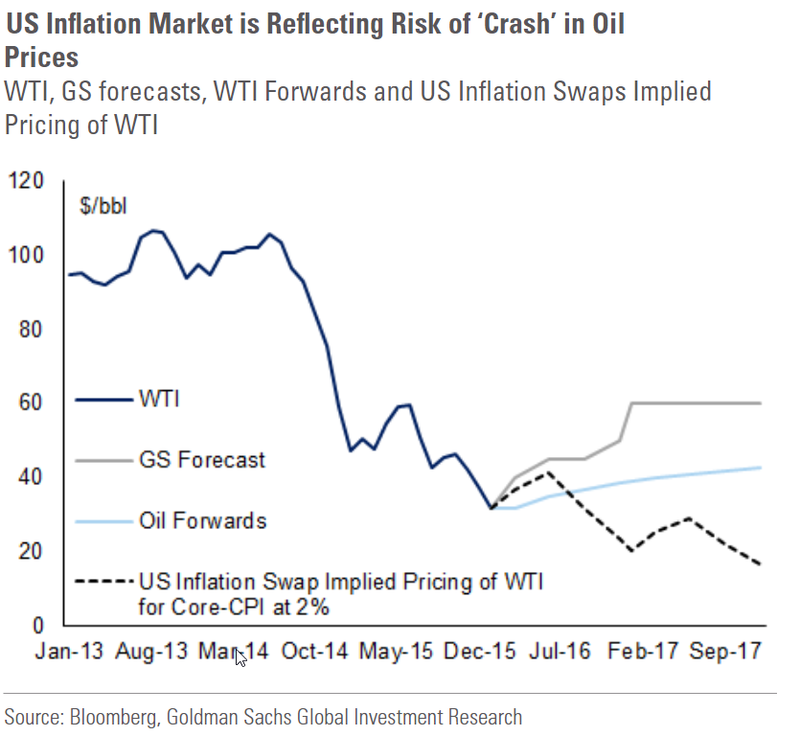 Some analysts (RBS for example) have been suggesting that deflation is about to sweep the global economy, pulling in the US along the way. For now however there is simply no evidence of deflationary pressures in the world's largest economy. Other indicators released last week could add to the ammunition of the more hawkish FOMC members. 1. US consumer spending was stronger than expected last month. Alas, some of this increase was driven by higher spending on healthcare, but it's an important data point nevertheless. 2. While this next item is more symbolic in nature, it's an important milestone nevertheless. US house prices (at least according to the government's index) are finally above the pre-recession peak. 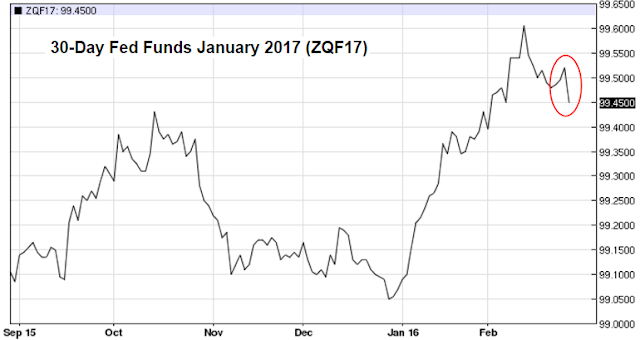 The futures markets are starting to react to all these reports, with the Fed Funds futures falling on Friday (lower futures prices imply higher rates). In the coming months the Fed will be closely watching two key economic measures as the Committee contemplates further rate hikes. 1. Any indications of acceleration in wage growth will get the Fed going again. The high-frequency Gallup jobs indicator suggests that US labor markets remain stable, but material improvements in wage growth have been elusive. 2. The recent market turmoil has ignited concerns about tight credit conditions. The Fed's surveys suggest stricter underwriting standards in business lending while other indicators point to weakness in credit availability for middle-market and smaller businesses. And of course credit spreads have risen sharply, especially for the more leveraged firms. However the overall corporate loan growth remains close to 11% per year - for now. Some suggest that raising rates in the current environment is nothing short of insanity. Given the monetary easing by the ECB, the BOJ, etc. (as rates move deeper into negative territory) or the dovish stance by the BOC, the BOE, and others, the US dollar is bound to resume its rally, causing further damage to the US economy. 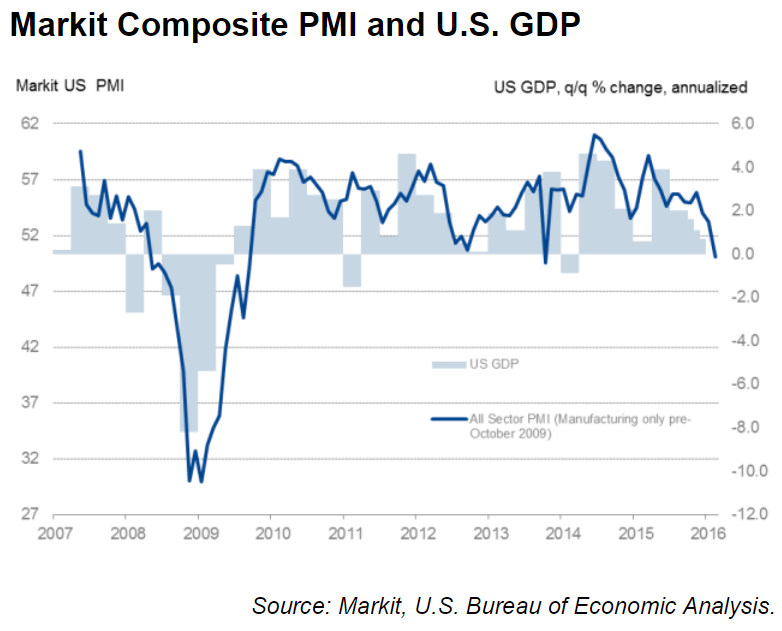 In fact the latest PMI measures, (from Markit as well as ISM) suggest that the US economic activity has already slowed sharply in the first quarter. Nevertheless, given the Fed's focus on some of the indicators discussed above, rate hikes in 2016 are now back on the table.